Do you see yourself as someone who would intervene to stop a crime? We've been studying the potential legal consequences that can come when gun owners cross a very simple and hard line that can get them charged with felonies. 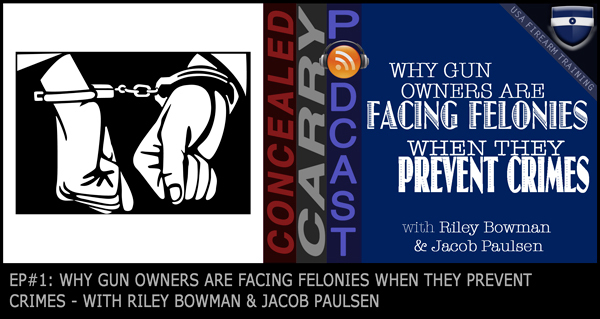 The main topic of this episode is to explore the ins and outs of when a citizens arrest or an act of legal self defense can cross the line into felony charges. The Brave Response Holster. This concealed carry holster has been on the market about a year with over 10,000 sold without any retail distribution. People love the waistband design, the spare magazine pouches, and the versatility with clothing and guns. Great 1st podcast, guys! You covered a lot of stuff regarding self-defense that I wasn’t aware of. Great advice on when to call 911. Subscribing to the podcast now. Awesome! Thanks so much for listening! It wouldn’t be possible without support from people like you! the CCW course. Keep it up. Good first session, any chance of posting a downloadable MP3? Daniel, we appreciate the feedback, but we think you’d really like it if you subscribed using one of the options below the player. This way you won’t ever miss an episode! Very much needed information. Thanks for bringing this information out as it will prevent innocent victims from becoming criminals. Keep up the great work! Glad to have provided some value to you! Keep on listening, much more GREAT stuff to come! Thank you for this important info. Greatly needed advice on self-defense and CCW training. Thanks for listening, David. Don’t forget to subscribe to the podcast so you don’t miss any of our weekly episodes!! Obama does not get to “appoint” a Supreme Court Justice. He gets to nominate a candidate for the seat. The Nominee must be voted in as Supreme Court Justice by the US Senate. There are several nominations available. You are correct, my apologies if in the “heat of the moment” of producing our first unscripted podcast we were not semantically correct. Thanks for listening! Wow! That was alot of great information! Thank you guys for doing this and I will be copying the link to our security team and will be meeting to discuss the podcast. Thanks, Joe, glad it was helpful for you (and your team). Please do continue to give us feedback, and we would also greatly appreciate you leaving a review on iTunes if that’s where you’re downloading from. Very nice show I look forward to many more. Thank you for the info…I am a Utah resident. good stuff to bear in mind, if and when and hopefully never get caught in this situation. A city policeman was recently assaulted by a felon in Salt Lake. Bad guy took a swing with a lawn ornament and bout took the officers ear off. I would have been ticked. A human response. To bad his fellow officer didn’t step in quickly when the assaulted officer hit the felon with his club. A human Reaction. hopefully the cop will not be reprimanded in any way. This is great, important info, please continue with future episodes! Lloyd, the podcast will always be published here on our site and you can read our notes and listen via your computer browser or phone browser. We don’t have any plans to transcribe the audio into text and make it available. Awesone show Riley and Paul. What you guys discussed was beneficial and I’m sure most would agree. It makes perfect sense.. I, personally, hope I may never find myself in such a situation, however if I were I would use my sense and logic to defuse the situation, first and foremost, without having to draw a firearm or make a deadly threat as that, not only, could have criminating consequences but could also have deadly consequences. I aim to make conscious decosions. Always a great idea to look around and be aware of our environment and careful as to who we associate with.. Thanks for the educating info. GOD Bless. Have a blessed day and stay encouraged. Read carefully your state law of concealed permit and/or without permit in re to protecting yourself, someone in an attack, robbery or otherwise crime. You cannot hold someone, a burglar or face kidnapping charges, cannot shoot or at someone fleeing a crime scene or face felony assault/battery charges. Call 911 and when the police arrive, put the gun down on the ground and put hands up, do not admit anything beyond 911 call, prepare to be handcuffed and booked. Be respectful to police. When necessary, call your lawyer. Good info and Best Wishes for future programs. The one thing I stress to CCW students in my current classes is their first responsibility is to get them self safely home to their families. The safety and future wellbeing of spouse and kids should be the deciding factor as to attempting to stop an in progress felony. Police officers are trained to go toward a problem; not a wise decision for a civilian. I am a retired Police Officer. A question for Riley: any relation to Tom Bowman? I worked with him at the Thornton, Colorado Police Department back in the 70’s. Nice podcast. Just subscribed under iTunes and I am listening to the backlog to catch-up. Lots of info. I think this podcast was the one where Jacob talked about the money belt he wore. He said he had not found a good money/gun belt. One of my Christmas presents this year was a belt available from the NRA store. It is a money belt and has a polymer internal reinforcement. I have been wearing it daily and find it does a great job. Might want to check it out NRA Cash n Carry Holster Belt ( http://www.nrastore.com/sportswear/belts-and-buckles/nra-cash-n-carry-holster-money-belt ). Looking forward to future podcasts. Keep up the good work.